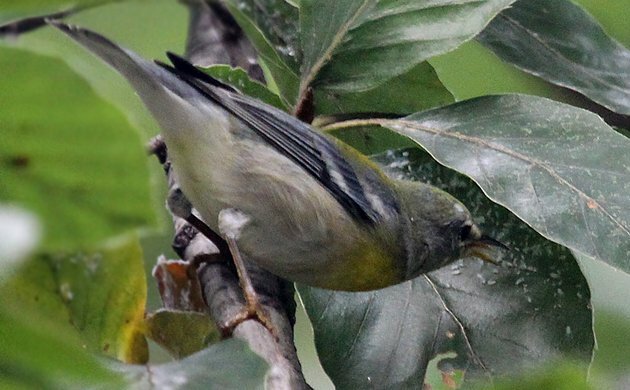 While walking through Central Park on Friday I came across a Northern Parula foraging by the side of the path. It was very focused on a single leaf and when I looked closely at the leaf through my binoculars the reason became pretty clear. There was some kind of insect eggs or larvae sprinkled liberally all over the leaf. 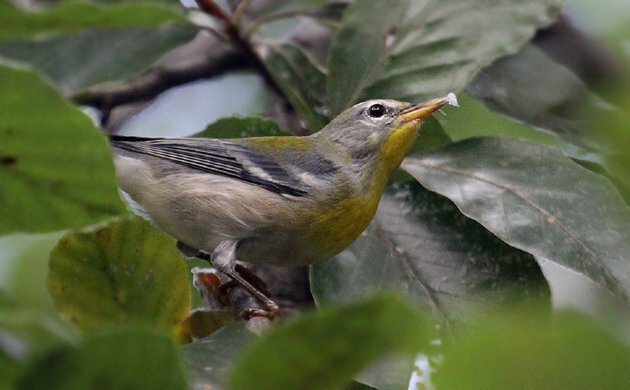 It was clear that whatever it was the parula was eating was coated in sticky silk but the interior must have been either delicious or nutritious because the bird stayed at the leaf and downed the items one after another for at least four or five minutes. 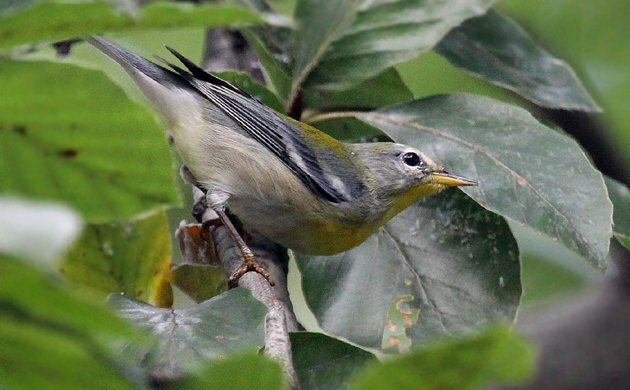 Here the Northern Parula grabs one off of the leaf. 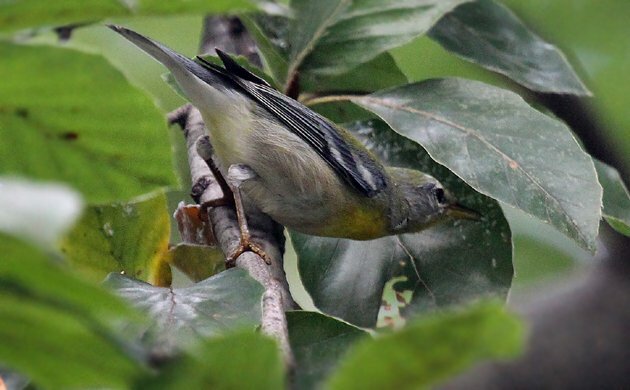 Note the sticky silk stuck to the parula’s beak in this shot. After every three or four the bird would vigorously wipe its beak on the branch on which it was perched. It paused in its eating when I sneezed to give me the stink eye. Then it was back to the leaf again. 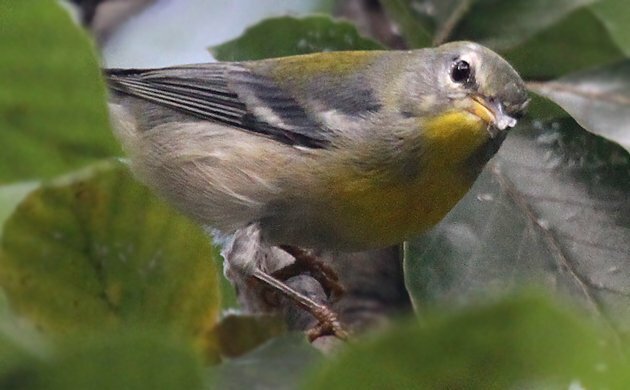 How many pictures have you ever seen that included Northern Parula tongue? If anyone has any suggestions as to what, exactly, the parula was eating please share them in the comments. I’d love to know what it was that provided such a buffet for a bird. I wonder if they might be something like aphids or scale insects. I think both can produce sticky secretions, and from a distance they’d both look more or less motionless. @John and Peter: Looks like it could be either to me. Thanks!